This delicious gajar ka halwa or Indian carrot pudding rounds off any meal beautifully. Do try my easy recipe. Take a thick bottom pan or kadhai. Add grated carrot with condensed milk and cook together on medium to low flame. Keep stirring constantly. Carrots will release water. You have to cook till all water has evaporated. It took me about 40 minutes. Now add ghee, cardamom powder and sugar (optional) along with khoya (optional). I personally don't add additional sugar as the sweetness from the condensed milk and the carrots is adequate. But if you like it sweeter, add sugar. Cook more for about 15 minutes til everything looks well cooked. You can see the ghee making the halwa shine. Now add some chopped cashews and raisins and take off the flame. 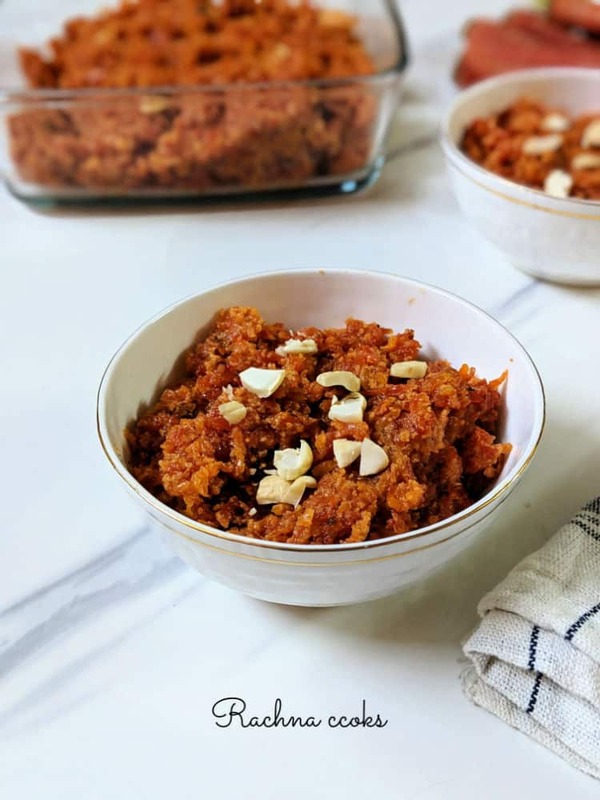 Serve the delicious gajar ka halwa warm, with ice cream, rabdi or as is. It is really tasty. You can use whole milk instead of condensed milk. It takes more time to cook off and form milk solids. Adjust sugar accordingly if you are using whole milk in place of condensed milk. Instead of grating carrots, I use my hand chopper to quickly get it into very small pieces thus saving the preparation time. Else grating 1.5 kilos carrots is very time consuming. Use your food processor if you have one. Use fresh red carrots which are naturally sweeter. You can reduce the amount of ghee by a little but not too much.